For more than a decade, Grounded. Coffee Catering has provided fair trade organic gourmet whole bean espresso, coffee bar and tea services to the Tri-State area. 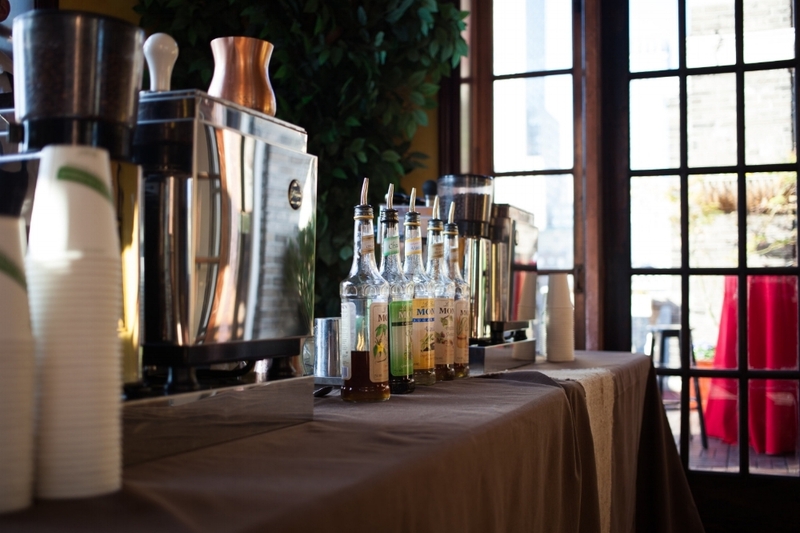 We regularly offer office coffee service, wedding and corporate event coffee catering in the five boroughs of New York City, North Jersey and Connecticut. This has included service at private homes for fewer than 20 people to multi-day large-scale conferences for thousands at venues like the Javitz Center and United Nations headquarters. We offer service outside the Tri-State area for additional fees. Featuring up-front and transparent pricing, our packages are configurable, scalable and tailored to your unique needs based on guest count, venue, preferred decorations, space allowances and time frame. We work with individuals, event planners and venues to ensure all essential details are incorporated effortlessly, collapsing and expanding our setup to fit the room. We use ceramics or glassware when provided to us, but always provide our compostable 8oz and 4oz cups for each service. Click the let’s book link above to contact us to discuss your needs. We bring a fully functioning, self-contained espresso, coffee, and tea bar to you. Custom menu to match your theme or event. Table and linen setup, bottled and filtered water for espresso drinks. Slection of organic dairy and non-dairy milks. Drop-off, setup, clean-up and pick-up after event. Fresh made gelato from a Paterson New Jersey staple, Gelotti's, (vanilla is standard) scooped into compostable bowls to order, and topped with a freshly pulled, steamy espresso shot. We provide Vegan espresso, coffee, and tea services and will accommodate allergies. Hand-blended sugar syrups with soda water, poured over ice, and stirred to order. Cremosas include a touch of cream! includes all menu items iced, custom menus, as well as the addition of organic cold brewed concentrate for strong, delicious cold ones. Please note Grounded. coffee catering staff will be away and unresponsive from 3/13 - 3/24. Thank you for your consideration. Since 2007, grounded. coffee catering has been providing an on demand cafe to the entire New York City Metropolitan area including: Brooklyn, Queens, Staten Island, Bronx, Manhattan, Long Island, North-Central-South New Jersey, Hudson Valley and Lower New York State. We also serve Connecticut and beyond. We have flown our equipment and portable cafe with barista to large trade events in Los Angeles, San Diego and will travel as requested. Please Contact Grounded. Coffee Catering With Any Questions Or Event Inquiries. Thank you for your consideration. We will respond soon to your request for service in the New Jersey area.